Kids in wheelchairs can play many of the same games as students without physical disabilities. Teachers may have to use creativity to design an adaptation for students who are wheelchair bound, but many sources exist to help teachers share ideas, such as the Palaestra website. As a Palaestra article about activity ideas for students who have physical disabilities states, "Sometimes one educator's idea will spark several new adaptations or new activity ideas. A few people sharing a few good ideas can cascade into a flood of great new ideas." Most sports have a version that children in wheelchairs can play. The National Veterans Wheelchair Games hosts a Kids' Day each year where children can meet the athletes in wheelchairs and be introduced to the sports they play. For example, children in wheelchairs can play Wiffle ball or softball. They can learn to throw a ball, catch it and bat. They can use their wheelchair to make their way to first base and even to score a run. Another popular sport for children and teens in wheelchairs is wheelchair basketball. Players dribble, pass and shoot just like the NBA players. Wheelchair kickball is also popular--children can play with students in or out of wheelchairs and the same rules apply for both. Besides sports, children in wheelchairs can play other games with balls. Palaestra, the forum for sport, physical education and recreation for those with disabilities, has several activity ideas on their website for children with physical disabilities in wheelchairs. 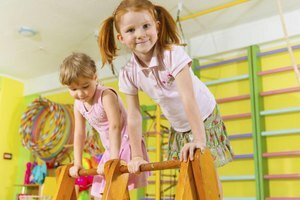 Some of their suggestions are for students in wheelchairs to form a circle and roll or throw a large ball to each other using their hands or feet, tether ball and a type of bowling where pins are set up and knocked down with a large ball in the gym. Older students in wheelchairs may enjoy a game of good old-fashioned dodge ball or even four square, if you can make the squares larger than normal to allow for the wheelchairs. Children love races, and there are easy wheelchair games to play. You can create wheelchair relay teams, where students have to pass a baton to one another as they race around the gym or track against other teams. You can set up individual races--long and short distance--and you can even have a racing unit to talk about different techniques or skills that would improve speed and muscle coordination. Obstacle courses are also fun for students in wheelchairs. The PE Central website lists a lesson plan idea for a wheelchair obstacle course to teach students disability awareness. However, you can adapt this lesson plan for students who need wheelchairs too. Several variations are given for the obstacle course idea. The important thing to remember is safety, whether your children are in wheelchairs or are taking part in disability awareness activities. Make sure the gym obstacle course is a safe environment for the students. Dill, Margo. "Games for Kids in Wheelchairs." Synonym, https://classroom.synonym.com/games-kids-wheelchairs-5996699.html. Accessed 23 April 2019.